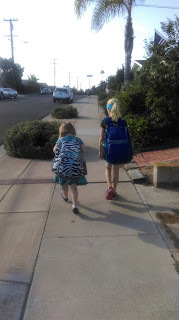 Today was the first day of school for my kids- and the first day of Kindergarten for Petunia. Everything went well. The only person who cried at drop off was me, and I had sunglasses on, so only Mr. Snarky knew. I'll be interested to see if Petunia has the same delayed anxiety about the immersion program as Pumpkin did. They have very different personalities, so perhaps she won't. But not being able to understand what your teacher is saying has got to be really hard for a kid, so perhaps she will. Regardless, I'm going to try not to worry about it. We're going out to dinner tonight to celebrate the first day of school, and we'll just focus on that for right now. Last night, as I was making the scones that Petunia likes for lunch, I was thinking about how the new school year has always been my favorite time to start new habits- I like it even more than the new calendar year. 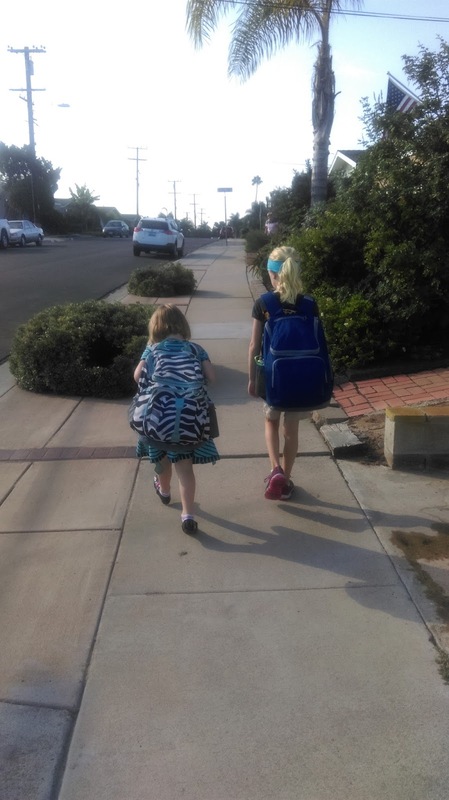 I'd fallen out of this practice, since it has been something like 20 years since I had anything that felt like "back to school" myself, but having kids gives me the chance to revive it. I decided that I'd revive my practice of getting up 20 minutes early and going for a run, and did indeed do that this morning. We'll see if I can keep that up. I also decided that I'd run a "back to school" sale on my books, spurred on by the idea that maybe some people out there are wanting to make a "fresh start" by leaving academia, and Navigating the Path to Industry can help with that. One of the great things about running my own company is that I can make a decision like that on a whim, so why not? But, since this was a bit of a last minute whim, I didn't have time to change the prices in all the distribution channels. So, the sale is running through an offer code at my GumRoad account. If you purchase an ebook via my GumRoad account, you get the MOBI file (for Kindles), the ePub file (for other ereaders), and the PDF (for printing or reading on your computer), so although it isn't quite as easy as just clicking "buy now" on Amazon and having the book arrive magically on your Kindle, it isn't hard, either. For the next week, if you enter "backtoschool" in the offer code box when you order Navigating the Path to Industry or Unspotted, or when you purchase the recording of the Run Better Meetings seminar, you'll get 30% off the purchase price. Hurry- this offer ends next Tuesday, September 15 at midnight. Next, I read Graham Swift's 'England and Other Stories'. Unspotted reminds me of 'Hoffmeier's Antelope', a story in Swift's first collection of short stories, 'Learning to Swim'. Graham Swift can pack more character development into an 8 page short story than many 500 page thrillers. I hope you pick them up. BTW, unspotted is just the right length for the story. Not padded out to fill a small book, not chopped to fit a magazine article. There is much value in sizing a read to what the material demands. Perfect. I'll look for the stories by Graham Swift! They sound great, and I'm always looking for interesting stories for my Tungsten Hippo site. I'm glad you really liked Unspotted! I completely agree about sizing the read to what the material needs. I wish more business/management books would do that. I like to read them, to keep up to date on the research and what other people are doing... but most of them are ridiculously padded. Are books published to be sold? Or to be read? Our attention time often costs more than the $ to purchase the book. Padded books insult us by getting the value proposition backwards. When I read posts like these, it makes hopeful that someday I"ll be able to have my own business and yet spend special moments with my children. I think I am moving in that direction, but I have some more work to do.